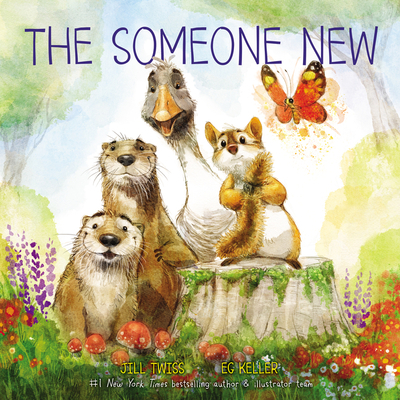 From Jill Twiss and EG Keller, the author and illustrator team behind the #1 New York Times bestselling picture book Last Week Tonight With John Oliver Presents A Day in the Life of Marlon Bundo, comes The Someone New, a fresh and timely story about how it feels when someone new comes knocking at your door. Jitterbug the chipmunk likes it when things stay the same. So when one day Pudding the snail comes into her woods, Jitterbug worries that everything will be different. What if Pudding spoils everything? What if there’s no more room for Jitterbug? With the help of her friends, can Jitterbug welcome the newcomer and learn that kindness is stronger than fear? Jill Twiss is the author of Last Week Tonight with John Oliver Presents: A Day in the Life of Marlon Bundo, a New York Times #1 bestseller. She is also a comedy writer who has won multiple Emmys, WGA Awards, and Peabody Awards for her work as a staff writer on HBO’s Last Week Tonight with John Oliver. In her not-so-spare time, Jill writes sentences for the Scripps National Spelling Bee on ESPN and is working on a musical about the women of the Seneca Falls Convention. EG Keller is the illustrator of the New York Times #1 bestseller Last Week Tonight with John Oliver Presents: A Day in the Life of Marlon Bundo and the picture book His Royal Dogness, Guy the Beagle: The Rebarkable True Story of Meghan Markle's Rescue Dog. As Gerald Kelley, he illustrated documentarian Ken Burns’s New York Times bestselling book Grover Cleveland, Again! and wrote and illustrated the picture book Please Please the Bees, which won the 2017 Frances and Wesley Bock Book Award for Children’s Literature and was read aloud for Storyline Online by Rashida Jones. Keller lives in Colorado with his husband.